All readers of Business Travel News will, I’m sure, agree with me that aviation plays a vital role in supporting the UK’s economy and connecting British businesses and people with the rest of the world. As Howard Davies’ Airports Commission moves closer to publishing its provisional findings I fear that the importance of our industry will yet again be lost in the debate over where new capacity should best be provided in the South East. Over the last few decades more heat than light has been generated in this long running saga and as a relative newcomer to the industry it seem to me that there is more agreement on this vital issue than some critics claim. First, it is accepted within our industry – and across the business community more generally – that over the next few decades there will be demand for new aviation capacity in the South East. Second, our industry desperately needs a roadmap for that aviation capacity. There are different views in our industry on the precise way to achieve that but we all agree that we want certainty. easyJet’s main ambitions for Howard Davies' team are that this is the last such review and that all political parties agree to the Commission’s recommendations – whatever they are. As a pan-European airline with aircraft based at 23 airports across Europe and operating to more than 130 in total we have direct, informed experience of capacity issues across our continent. Our business model also gives us a distinctive perspective. Since we were founded in 1995 with a mission to provide safe, affordable and convenient flights we have revolutionised the way people travel in Europe and now carry over 60 million passengers per year on some 650 routes with a fleet of over 200 aircraft. This success has been built on our simple, efficient, point to point business model. We fly one sort of aircraft which all our crew and engineers can operate on. Without a business class, we have more seats per aircraft. We have load factors of around 90%. We utilise our aircraft efficiently – usually taking 25 minutes to turn them round at an airport. Lower costs mean lower fares for our passengers. We fly to and from primary airports, operating more of Europe’s biggest routes than any other airline. Everyone at easyJet feels passionately about making travel easy and affordable for our passengers at every step in their journey. easyJet is now Britain’s biggest airline carrying more passengers than BA and Virgin combined. I only say this to illustrate one of the key points we have made to the Commission – namely that the most successful aviation business model of the last decade is point to point. The reason for its success is because it provides passengers with what they want – direct flights to where they want to go, and at a good fare. An airport like Edinburgh now has a choice of 31 destinations served by easyJet on direct flights without the cost and inconvenience of connecting through London. Examples include Athens, Amsterdam, Berlin, Iceland, Madrid, Paris CDG and Geneva. Routes which flag carriers lost money on or wouldn’t even contemplate flying are profitable for us. That leads to our second point, which is that the airport infrastructure we operate in today reflects the business model of 30 years ago – hub and spoke. When planning the infrastructure of the next 30 – 50 years the Commission should reflect on this as recent trends are more likely to shape the future of aviation than the old ways of working. Point to point accounts for around 90% of all passenger journeys in UK airspace and even at Heathrow less than 20% of passenger journeys use the airport to transfer to another flight. There is an over-emphasis on the importance of the hub (or “focal” as described by the Commission) airport and we ask that aviation policy does not favour hubs and transfer operations over point to point. The economic benefits of aviation are almost entirely from passengers who begin or end their journeys in the UK - including Heathrow. There is minimal direct benefit from transfer passengers. Existing capacity should be fully utilised. For example, in the short-term Luton and Southend could enable 10 million more passenger journeys a year without any new runways. 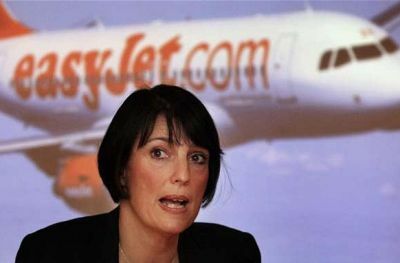 easyJet is open minded at this stage about medium to long-term options. 2. Airports should only build the infrastructure that provides the level of service that passengers value and are willing to pay to use. There should be no gold plating or expensive infrastructure that passengers don't value. 3. Passengers should only pay for new infrastructure when they actually use it – like toll roads – and not for years in advance. The latest announcement from the CAA on the future of regulation at Gatwick has given us real concerns about the lack of regulatory control of a proposed second runway at the airport. Using GAL’s own figures passengers could be paying £28 more per flight for years in advance of the opening of a new £9 billion runway without any real oversight by the CAA. Finally, all new capacity must be delivered sustainably. Sustainable Aviation’s work shows that aviation emissions can be put on a downward path without artificially constraining demand. We recognise that local noise and environmental impacts need to be addressed as part of specific proposals and we look forward to the Commission's considered views on these. To conclude, passengers want to travel point to point and only transfer if they have to or if it is cheaper and they are very price sensitive. Future connectivity will be driven by the demand from point to point passengers rather than transfer. Above all, the future of aviation capacity should be determined by consumer demand – not central planning - and needs to be delivered cost effectively.